Bangalore FOSS Community celebrated today (September 16) as software freedom day (teams around the world celebrated the day with passion and fun). 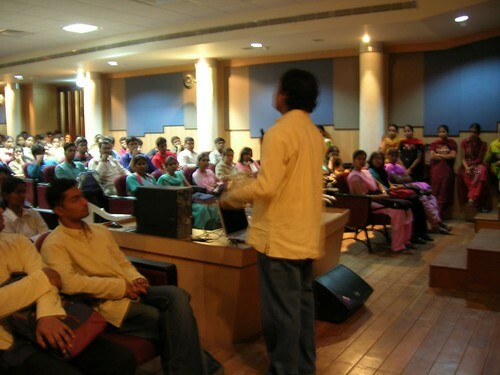 In Kerala Schools taught the values of community, sharing of knowledge..
We had sessions at three colleges in Bangalore. In BMS the sessions wer handled by Aanjhan, me, Dilip, Srikanth and Dinesh. In DSCE Laxmi, Ramaprasad and Kanti handled sessions where as Moinak Ghosh, Prabhod and Saurabh from Sun Microsystems along with his other colleagues presented the day at MVIT. I will write about my experience at BMS here. Lets wait for other folks’ scribbles. First of all I would like to congratulate Netravathi B, Sharada M and their friends who helped us make this event a grand success. Hats off to you folks ! Also all the students and FSUG team who made the day a memorable one. Share your thoughts for a Free Society NOW! 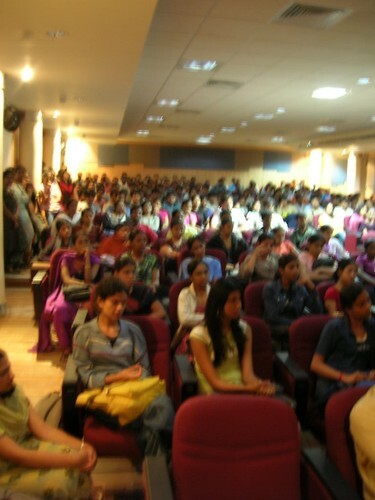 I reached BMS College by 9 am and we started the event around 9 30 with Revolution OS and Aanjhan took over by 10.The auditorium was fully packed and it was about 350 students, even some of them were sitting on side steps, and many standing even after bringing some more extra chairs. We had really good interactive session where we clarified basic confusing terms like Free Software, Open Source Software, GNU/Linux, hacking. It was really great to see audience correctly answering some of these queries. We stressed the benefits of contributing to Free software and career opportunities. Srikanth explained the basic motivation behind the computer technological advancements, we are trying to reach as close as possible to the human bodies functionuing (memory, logic, recognition…). We had a rather boring session (should I say quite unwelcome session?) on SUSE Linux 10. It was a complete marketing presentation by one of the Novell folks where he kept playing some movies and talked how SUSE is superior and Novell is the reason for Microsoft to postpone Vista release. We thought it will be some technical presentation about cool features of Novell 10. He even said Debian is a company. Except for this session it was awesome. We kept smiling at some of his claims. Like how can you ‘download’ windows application to ‘linux’ using mono. But we learned some positive lessons from that. See corporate eye ball trap by Atul (this not exactly the case here though, since SUSE is Free Software). But it gave the students a different perspective and some of the facts which we didn’t wanna tell them. Like our main motivation is to help students to learn and be part of such an amazing community, so some one had to do the marketing stuff. But I was happy with the fact that he took some time to spent with us I would like to thank him for participating in Software Freedom Day. Anyway the moment he finished we announced BoF sessions for interested folks. About 60 people stayed back and we splitted into 4 groups and addressed their doubts and asked about their interest areas. Me and Dilip took charge of one group and we had a very interesting discussion. Other three groups were handled bu Aanjhan, Srikanth and Dinesh. We had to leave the hall only because they had to close the hall and we left the campus becuase it was already 1 30 and all of us were started feeling hungry. Me, Dilip, Aanjhan and Srikanth had lunch at angeethi and was back home by 4. It was a great experience we are excited to continue work with them. Stay tuned to bmslug. Congrats again to Nethra and Sharada. 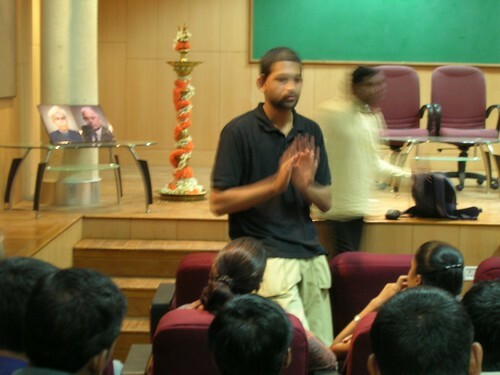 Also to Ramaprasad who was with me from the beginning. Update: Link to Atul’s blog about corporate eye-ball trap added. Now after reading that again today I felt so bad at the way the presentation was done. I think it was even worse, because it was a community organised event and it got hijacked. The events which Atul talk about was organised with such motives from the beginning. 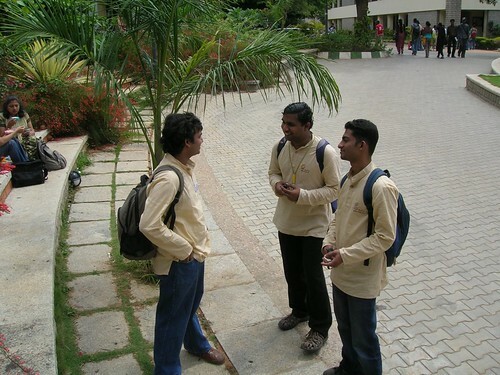 Srikanth has posted the album see here.